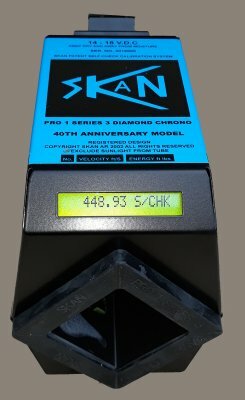 The official site for the skan range of chronos. Designed especially for air weapons, each CHRONO is individually calibrated to a master CHRONO. 25% higher resolution means even better accuracy at higher velocities. Direct readout in ft/sec with energy in ft-lbs. 50 shot memory giving full statistics with individual shot retrieval. Retains information after power off. Patented self-check calibration at the push of a button. 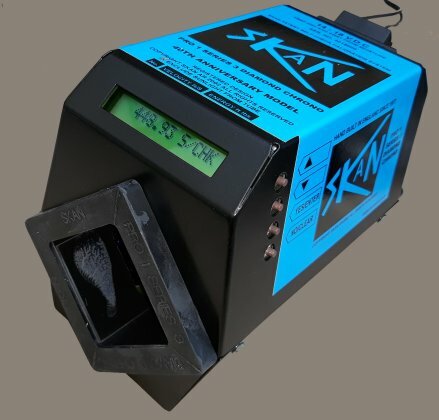 Usual SKAN 5 Year warranty. Simple 4 button menu driven LCD. Totally recessed SKAN wide beam infra red system. Velocity range 40 - 4000 ft/sec. Weight range 1-49.9 grains. Rubber shoot tube bezels and powder coated custom steel case. SPECIAL COMPUTER VERSION WITH BUILT IN INTERFACE C/W USB LEAD. SUPPLIED WITH SKAN MK9 POLICE MODEL CHRONOLOG WINDOWS PROGRAM ON CD. THIS PROGRAM ALLOWS UP TO 250 SHOTS ON SCREEN WITH STANDARD DEVIATION,FULL DATA LOGGING ALLOWING EASY RETRIEVAL OF PREVIOUS TEST RESULTS.